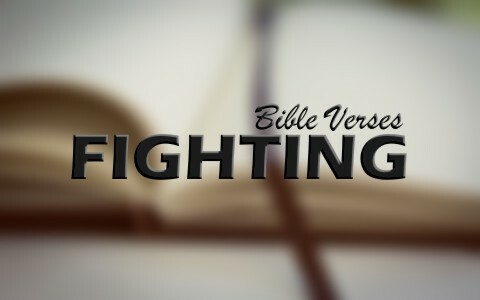 The Bible has a lot about fighting…some of it justified and some of it not. Here are my top 8 Bible verses on fighting with a personal commentary about them. Here is a supreme example of when fighting is good. We fight “the good fight of faith” meaning that we customarily examine ourselves to see if we’re actually in the faith as Paul wrote in 2 Corinthians 13:5 “Examine yourselves, to see whether you are in the faith. Test yourselves. Or do you not realize this about yourselves, that Jesus Christ is in you?—unless indeed you fail to meet the test!” What kind of test is this? It is the test to see if you really are in Christ and that means whether you are living in obedience to His commands and if you have had a time in your life where you’ve repented of your sins. What was this “fighting without” and “fear within” Paul was writing about? I believe it is fighting the temptation to rest, relax, and turn away from what God has called Paul and all of us to do. Paul wrote that at every turn, he faced affliction and this caused him to fight his own natural tendency to give up. The “fear within” was perhaps knowing that whenever he came into cities to preach the gospel, he would face every kind of opposition; imprisonment, beatings, stripes, stoning, and attempts to take his life. He was an amazing evangelist and missionary but he was also like us in many ways and fought against his own flesh (Rom 7) and had internal fears that may have been a fear of failing in God’s calling for his life. Jesus could have called legions of angels, His servants, to come and fight for Him and all of the legions of Rome wouldn’t have been enough to stop them. Jesus knew that it was not that time…yet! That time is coming and we can read about it in the Book of Revelation. Jesus came in as the Lamb of God, meek and mild as the Savior, but will come back as the roaring Lion of the Tribe of Judah as the King of kings and Lord of lords, devouring every foe and destroying all who oppose Him. Here is fighting that is completely justified. Michael and all the angels fighting with him came and fought the dragon and all of his angels. The dragon of course is Satan and his angels are the demons who are opposed to God and to every believer in Christ. There wasn’t any place found for them in heaven after Michael and his angels were finished. Here is an example of a just war. Joshua and the nation of Israel were to rise up and fight the forces of Ai. This pagan nation was doing some very deplorable practices, as most of the pagan nations were at that time. They were so steeped in idolatry that many of these nations were sacrificing their own children in the fire to a god that didn’t exist. This is Satan’s religion where there is no true God and that the sacrifices are such an abomination to God that He wanted them all wiped out. This is a case where God is actually fighting against His own people and as is typically the case, He brings other nations in to discipline His own people. Why did God send the Chaldeans (or Babylonians) against His own people? It was because of the offerings that “have been made to Baal and drink offerings have been poured out to other gods” and this breaks the very first commandment that they are not to have any God before the One, True God (Ex 20:3). God will not tolerate any other gods before Him or in place of Him. Here is where God tells the nation of Israel, through Jeremiah the Prophet, that even if the whole army of the Chaldeans were defeated, He would still find a way to ensure that Judah would end their pagan practices and idolatry. God is able to raise up stones to life (Luke 19:4) so what would ever prevent Him from disciplining His own people when it was necessary? David was king but he was also a mighty warrior and God fought battles through him and when we are fighting battles for the Lord, “evil shall not be found in you” and us “so long as” we live. It’s better to fight for the Lord than to fight against the Lord, for the latter is hopeless, the former is certain. We all fight the flesh in our walk with Christ. How many of us can identify with Paul who wrote “I do not do the good I want, but the evil I do not want is what I keep on doing” (Rom 8:19)? I know I still battle my own flesh every single day but for those who are the children of God, we fight from victory, not for victory for “If God is for us, who can be against us” (Rom 8:31)? The answer of course is no one can prevail against us if God is for us for who is mightier than God? Take a look at this related article: What Does the Bible Say About War? Previous post: What Are The Seven Seals In The Book Of Revelation? Next post: Can The Bible Become An Idol?